Quanser's partner, Enable Training and Consulting Inc. has been recently named an Education Specialty Alliance Partner by National Instruments. The first-of-its-kind designation certifies Enable as a go-to partner for educators and researchers looking for assistance with integration of NI hardware and software solutions. 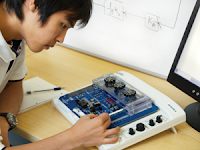 Using its expertise and experience, Enable can work with universities and colleges to make sure they get most out of their LabVIEW and NI hardware-based tools. The offering spans from development of comprehensive and engaging curriculum to product setup and training, making sure NI solutions are effectively integrated in both classroom and lab settings. Users of Quanser-NI platform for control research and education could already benefit from the strong Enable-NI partnership. Quanser collaborated with Enable developing modern media-rich courseware for engineering education. "Enable has a unique mix of control systems and LabVIEW experience," says Keith Blanchet, Director of Business Development at Quanser. "We are very pleased to partner with them to better serve our growing community of NI platform Quanser customers." Congratulations, Enable! We are looking forward to bringing this collaboration to the next level.